Essays consider recent artistic and critical approaches to materiality, focusing on the moments when materials become willful actors and agents within artistic processes. Materiality has reappeared as a highly contested topic in recent art. Modernist criticism tended to privilege form over matter--considering material as the essentialized basis of medium specificity--and technically based approaches in art history reinforced connoisseurship through the science of artistic materials. But in order to engage critically with the meaning, for example, of hair in David Hammons's installations, milk in the work of Dieter Roth, or latex in the sculptures of Eva Hesse, we need a very different set of methodological tools. This anthology focuses on the moments when materials become willful actors and agents within artistic processes, entangling their audience in a web of connections. It investigates the role of materiality in art that attempts to expand notions of time, space, process, or participation. And it looks at the ways in which materials obstruct, disrupt, or interfere with social norms, emerging as impure formations and messy, unstable substances. It reexamines the notion of "dematerialization"; addresses materialist critiques of artistic production; surveys relationships between matter and bodies, from the hierarchies of gender to the abject and phobic; explores the vitality of substances; and addresses the concepts of intermateriality and transmateriality emerging in the hybrid zones of digital experimentation. 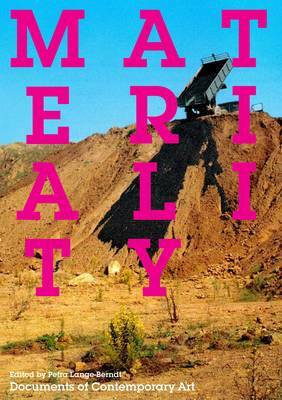 Buy Materiality by Petra Lange-Berndt from Australia's Online Independent Bookstore, Boomerang Books. Petra Lange-Berndt is a Lecturer in nineteenth- and twenty-first-century art at University College London and a leading researcher in the field of material studies in art history. She is coeditor, with Dietmar Rubel, of Sigmar Polke: We Petty Bourgeois! Contemporaries and Comrades, the 1970s.